Do you feel like practicing mindfulness when you’ve just been ditched by your partner? Or when you’ve been laid off? Chances are you don’t. Me neither. In a dark period, you wish you could just stay in bed and fast forward until the pain is gone. You know that your best option would be to meditate since mindfulness relieves depression and anxiety. Unfortunately, depression and anxiety also act like powerful obstacles to practice: they rob you of any will to practice. Nearly all the meditators I know have that problem, I guess we’re all the same in that regard. How to stick with meditation in hard times and make it a powerful ally, not just a drag? To answer this question, I collected practical advice from Buddhist masters and advanced practitioners during 15 years, I summarized them below. This post will show you how to smash the “meditator’s procrastination” no matter what hardships you’re going through. Meditation can be the very first thing you do in the morning. If you decide to do it before anything else, you’ll win 50% of the battle against a crappy day. As you wake up, just sit right away on your pillow and start meditating. Do it before you plan your day, before you brood over the misery you’re going through. Do it even before you take a cup of coffee. That’s a great strategy because it doesn’t even give you a chance to find excuses not to meditate. By the time you’re fully awake, you’re done with your practice. That’s why this strategy is so powerful: it’s simple and it cuts through the painful mental bush that would disempower you otherwise. If you know you’re in a bad place, no matter what the reason is, be stubborn and go meditate. Don’t pay attention to the drama going on in your life. In order to go sit on your pillow when you feel bad, you need to be deaf to all the reasons your mind gives you to procrastinate. Picture a zombie that walks when he sees food, it will walk, no matter what. You need to be like a brain-dead creature, totally conditioned by the call of practice. You won’t make it by being smart here, but by being stubborn. Program yourself not to be satisfied until you’ve meditated. There’s a famous Buddhist story about perseverance in meditation: the Tibetan Yogi Milarepa gave his best disciple a piece of advice before dying. He showed his bare bottom, all calloused, for his disciple to see how much he had sat meditating, not missing an opportunity for practice, even when he had to sit on bare rocks, up in the mountains. OK, it sounds extreme, but it shows a direction to follow as meditators. 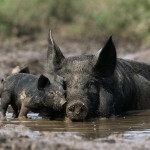 Think about a pig rolling in the mud, a happy pig that perceives his mud pond like a playground. Pigs don’t care, you shouldn’t either. When we’re trampling in horrible circumstances or disturbing emotions, our first reaction is to try to stay away from all that by seeking distractions (TV, Facebook, food…). No wonder meditating doesn’t appeal to us then: it’s all about being right here, right now. Right here, right now, in the muck of our daily troubles? That’s exactly what we’re trying to avoid! Jump in the mud pond and sit, accept the first minutes of discomfort as you face your situation then apply your meditation instructions as usual. There’s a form of acceptance that can be reached by sitting through a hard time, and bliss, sometimes. A typical excuse I use when I’m miserable and I try to not go meditate is the idea of screwing up. After all, since I feel bad and confused, there’s no way I can meditate properly, right? Do you experience that too? Well, there is no screwing up in meditation, they say: once you’re meditating, you do the best you can. Your best is simply the best. And you can be happy about your practice…As long as you make it to your pillow. Of course there’s always a risk of applying your meditation instructions badly, but it’s never as bad as not to meditate at all. If you liked this post, why not subscribe to gr0wing.com? excellent advice :) thank u Gael. Thanks Ale, I’m wondering if that article is not going to annoy a lot of people (nobody likes to be told what to do). What’s for sure is I shared stuff that I’ve successfully applied. Ah, I LOVE this. Thank you very much for posting. I am on the road at the moment in South Dakota, heading for Colorado. This morning I pulled over at a truck stop. Feeling tired+a little pitiful for myself+missing the guy I left behind and just generally thinking only of myself. I pulled in and parked and glanced up and saw a hill with waving grass that was really just daring me to climb it. I did. I got to the top and my oh my, it was wavey grass and cactus (i had no idea there would be cactus in south dakota) Cactus flowers, a few trees and green hills as far as I could see. It was in that moment I chose to sit. And I came back to the breath. It wasn’t super fulfilling, but I feel pretty good that I took the action. Siting in a funky restaurant now where I’ve just finished apple pie+ice cream for breakfast charging all of my tech. Headed to the Black Hills next. Gonna try the running meditation later. We’ll see. Thanks Becky! Keep us posted, care to share your Blog’s URL with us? I stumbled here Gaël–having gotten waylaid en route to meditating by the next muddy kitchen floor crisis (I’m a mom who meditates on the kitchen floor–LOTS of mettaphorical mud! )…and I wanted to thank you for your writing, which draws me in with its plain, direct, useful style (yes, utility is sometimes perceived as a barb by others, I feel the goodheartedness in what you’ve written). Especially, a big thanks for the Happy Pig idea! (more mud). I squirm and resist the mud, but whether you’re a pig, a child, or a lotus, that IS the place to grow from. Deep thanks. Well written my friend. Thank you for sharing!! Thank you very much Gaël for your helpful guidance. I’m starting to wake up at 4 A.M. everyday and it helps me a lot to organize my time and meditate more concentrated. Gee, Bahar, that’s not a half-assed schedule! Please let me know how you’re doing with your breatharian experience, I met several people who intended to do it, but no one who actually completed the project. there many types of meditation right? can you suggest some for beginners? I just gotta say, I have printed this article out, and I keep it in a place where I will see it as I move through my place everyday. Then, every few weeks, I turn to another page. It gives me encouragement right on the spot! Thanks again, Gael, for all the great writing.